I'm so excited for Halloween! I don't know why. It's always been my least favorite holiday. I've never really thought much about it until this year. I'm sure it has something to do with little "R". I know she won't remember this Halloween and the whole dressing up and trick-or-treating may just freak her out...who knows! But I'm so excited to find out. Honestly, I'm pretty sure she's going to love it. As soon as she gets one taste of the good stuff...the treats...I think she'll be a fan. As many of you know, well most of you probably don't, I didn't get married until I was 32. Little "R" was born when I was 34. So I had many years of childless years waiting for my turn to bask in the joy of kid loving holidays. My sister however was married at 18 and now has 3 teenagers, who still love Halloween! Probably because she always made it, and all other holidays, special and exciting. My sisters pretty crafty and amazing! She has been brilliant at creating the best traditions for her family; both meaningful and whimsical. 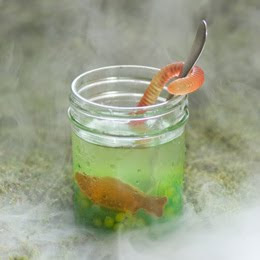 One such tradition that I think is pretty cool; Halloween inspired dinners. 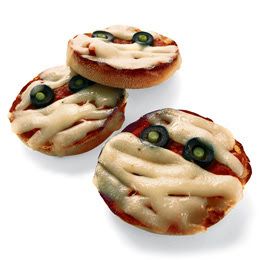 The week or several days leading up Halloween, she always makes spooky, gross, or scary snacks and meals for the kids. They love it and always look forward to her annual creepy creations. This year little "R" isn't quite old enough to really appreciate or "get" the concept of creative cooking, but by next year I'm hoping to start this same tradition. If you think this would be a cool tradition as well. 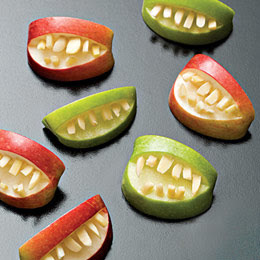 Click here for some awesome Halloween inspired recipes that are sure to please all the little goblins in your house. 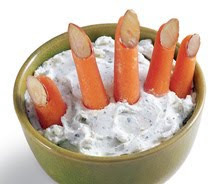 Recipe and photo's from "Family Fun Magazine"